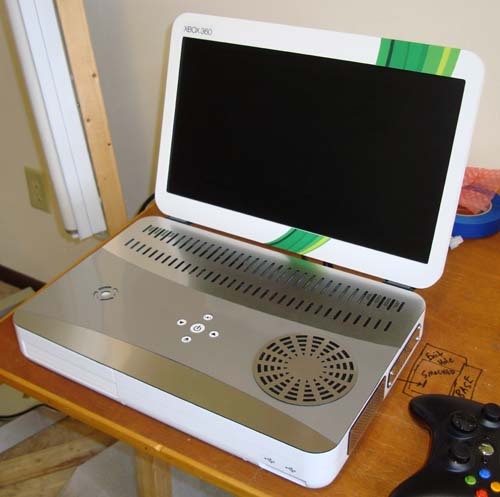 Xbox 360 Slim Portable with New Colors! 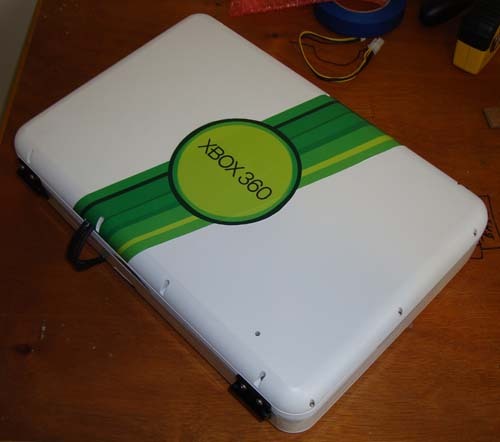 Have you noticed the new branding of the Xbox 360? I have, so I made my latest Slim Laptop match! It’s an all-white shell, with metallic insides, but has the new “green swoosh” colors that you see on all the new games and packaging. Other than that, it’s the same as the last 360 Slim portable I built, with the exception of the Power and Eject buttons which I made back into regular buttons. For more pics and a video, see the rest of this article. Portal Shirt – Just in time for Halloween! 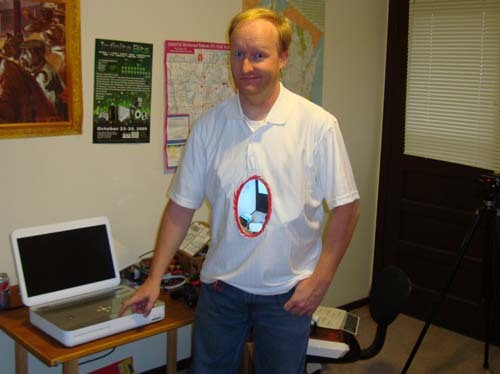 It dawned on me that making a see-through Portal shirt might be a huge success. It’s probably the geekiest Halloween costume you could possibly make. You see, I do what I must, because I can. The system consists of a front-mounted LCD, pocket-mounted battery pack and rear-mounted camera. And the best part is you can watch us build it on Episode 4 of the Ben Heck Show, since it is out of beta and releasing on time. This shirt is now up for auction to benefit the Able Gamers Foundation. Click here to check out the eBay auction! About 1.5″ inches narrower left and right, 1″ narrower front to back. Uses stock Xbox 360 Slim fan so it’s much quieter than my older 3 fan models. Touch sensitive power and eject buttons of the Slim have been preserved. Gateway 1775W 17″ widescreen LCD display @ 1280×720. Fan grate design copied from PS3 Laptop design. The construction of this unit is being covered over the first 6 episodes of The Ben Heck Show so be sure and check it out to learn how I put this thing together. This is the actual unit that is up for grabs as part of their contest, so one lucky winner will take this puppy home! I’m actually building 3 of these so besides the giveaway unit the 2 others are available to buy – if interested please email me. For more photos, check the rest of this entry. Enjoy, and we’ll see you on the show! Ben Heck Show Episode 2 Now Ready 2 Rumble! Pictured above is my new Xbox 360 Slim laptop in pieces. Why is it in pieces, you ask? Well, I’m taking it to finish assembling at Maker Faire New York this weekend. But wait – there’s more! Right now it’s a plain gray color. Those of you with an artistic slant, you are encourage to stop by the element14 / Ben Heck Show booth and help decorate the unit before the final assembly! The call is open to visitors and vendors alike. 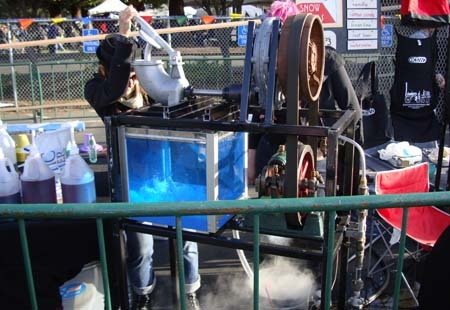 Call it the “Maker Faire” edition. For more details, visit element14.com/TBHS and makerfaire.com. Be sure to visit my booth at the New York Maker Faire this coming weekend. 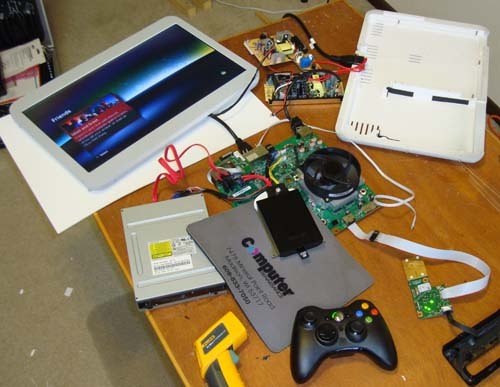 There will be demonstrations of building the Xbox 360 laptop, as well as a main presentation. You could also have a chance of appearing on our show as we’ll be filming there as well. Visit element14.com for more details! Remember, if you have any show / build ideas, post them on Element14’s page. Enjoy, and we’ll see you at Maker Faire New York next weekend.